I am eight years old and playing in the small back garden of our suburban house. I hear a deep loud resonant blast of a horn from the road out front It is Dad, returning with his new car from the showroom. Running around the corner of the drive I see him pulling slowly up at the garage. The engine note is a low heavy burble. The handbrake ratchets and the engine stops. My Dad has a massive smile on his face, My mum, standing at the front door has a small, almost shameful one. ‘So you got it then?’ She says. It is a vibrant and glossy red Jaguar, sticking out on our street like the shiniest apple in the orchard. Dad’s business was thriving and this was the reward to himself for a successful year. My brother and I took our shoes off and climbed around the inside. Dad turned on the 8-track and Mum told him to turn it down. I sat in the driving seat and rolled the huge wheel from side to side. Dr Hook throbbed out of the big speakers. A few weeks ago I got a call from a good friend who asked if I wanted a 1993 XJ6. He knew I liked old saloons, and that the Merc I was driving had seen better days. I asked him what colour it was. “Sort of a dark red”, he replied. “I’ll take it”. I said. On the way up to collect the car I remembered that time in my life, the child who started to love cars from the moment my Dad brought back that beautiful saloon. In time I could have told you what any car was on the road from one glimpse. I knew a car by the rear light cluster, I had Scalextric with rally Minis. Films like Smokey and the Bandit and Convoy were big sellers in the cinema. The Dukes of Hazzard was soon to appear on Saturday TV. We all had CB radios, we all had handles, we chatted to truckers passing on the main road at the end of our street. We played Top Trump Super Cars at school. ‘DeTomaso Pantera’ I’d whisper in awe. The moment I opened the door of the XJ6, memories came flooding back. There was the smell of leather and British workmanship. As a child the smell had been almost too heady, pungent and primal. In the heat the smell grew more and more intense, producing a sickening stickiness that didn’t help when my hot little legs would glue to the leather. To get through the hours of boredom on our long summer journey to the south of France I would try to read comics, but quickly turn white with nausea. ‘It’s the static.’ my mum would say. She made Dad install a rubber and steel conductor that reached the road from behind the mudguard. This wasn’t the car for the Mediterranean. 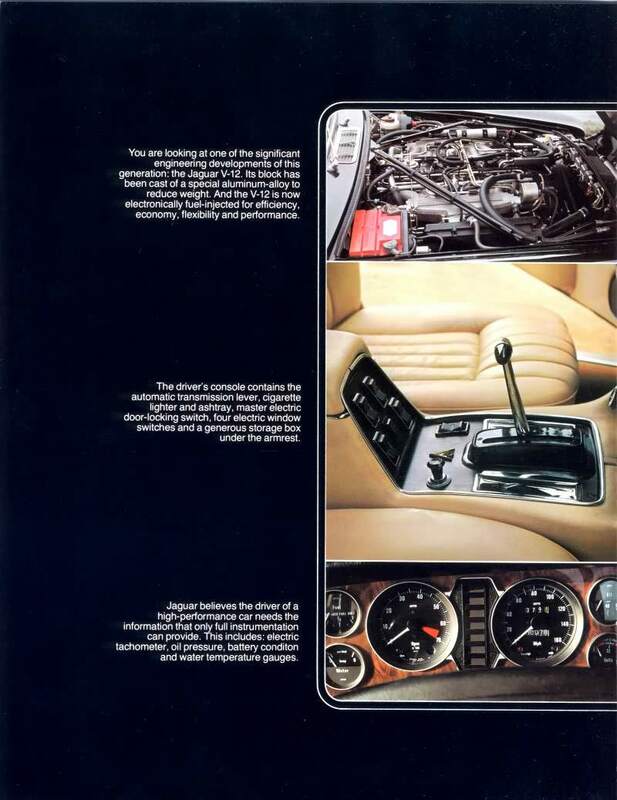 The Jaguar XJ6 from 1976 was a Northern European car. It was halfway between Get Carter and The Long Good Friday; it celebrated 1970s British culture and left a legacy of the times in its workmanship. This was the decade of strikes; British Leyland suffering from the stubborn unions and the popularity of cars from abroad. Even then I thought some of the switches and furnishings were below par. Did the carpets have a Leyland logo? I can’t remember. My 1993 model is not that dissimilar to the one from 1976. The gear stick has changed from the sleek T shape in Chrome and Bakelite that looked as if it had come from a BOAC jet, to a regular polished wood ball. I remember there had been plenty of buttons on the dash, just plain black rocker switches- they had been upgraded with the times to include an air-conditioning unit but still had the same sense of no-nonsense utility. There was one less large ashtray in the current model, and the beautiful dash mounted glove box from the seventies had been replaced by an airbag. I guess people just don’t wear gloves like they used to. I was heading home down the A303 recently and suddenly I became conscious of me and my new car. We were cruising along at 65, burbling pleasantly at 2000 revs. According to the computer we were averaging just under 30 mpg. I put my foot down and overtook a line of slower, less dignified traffic. I had a vision of myself somewhere between a law-abiding family man and a freewheeling, hardworking entrepreneur not afraid of taking a little risk.